Lisa Fifield, Oneida, is an exceptional watercolor artist. Her careful use of gouache creates a texture in her paintings that adds to their depth and their mood. 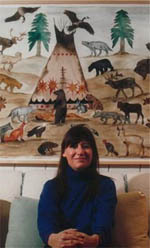 Lisa has won international acclaim for her portrayals of Native people.